The Asiatic Wildcat - also commonly known as the Indian Desert or Asiatic Steppe Cat - is often thought a closer relation to the African wildcat than to its eastern neighbour the European wildcat. In coloration the Asiatic cat resembles its African relation in having lighter coloured greyish yellow fur, although depending on its location it can sometimes take on more of a sandy/red appearance. The markings, which usually consist of small dark brown or muddy red spots, sometimes coalescing into stripes along the back and flanks, are more distinct. In common with other wildcat species the chin and chest are often white and the tail banded with dark rings and tipped with black. In size, the Asiatic wildcat is similar to the African species, although in some areas notably to the east of its range, it is often smaller than its relatives. The range of the Asiatic Wildcat reaches from Caucasus/Caspian Sea area across central Asia to Mongolia - to the south the cat is found in parts of Pakistan and the north east of India. In general the Asiatic wildcat prefers scrub desert habitats and often exists in areas with little water supply - they are rarely found in locations above 3000m . 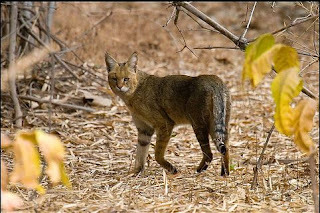 In common with the African wildcat the Asiatic species depends on rodents to supply the largest proportion of its diet - sand rat and desert gerbil are a common source of prey which is supplemented by Tolai hare, birds such as sandgrouse and peafowl. In common with other sub-species of wildcat the Asiatic cat is a considerable risk from hybridisation with feral and domestic populations - this is of most concern in areas of high human population density such as Pakistan and India. The cat has also been threatened by excessive uptake through hunting for its distinct spotted fur - although this has declined in recent years some suggest this as the reason for the Asiatic wildcats low population levels in certain areas. Habitation loss also poses a problem in parts of the cats southern range. Of the three common groupings of wildcat the Asiatic wildcat (Ornata Group) is considered to be the most at risk.